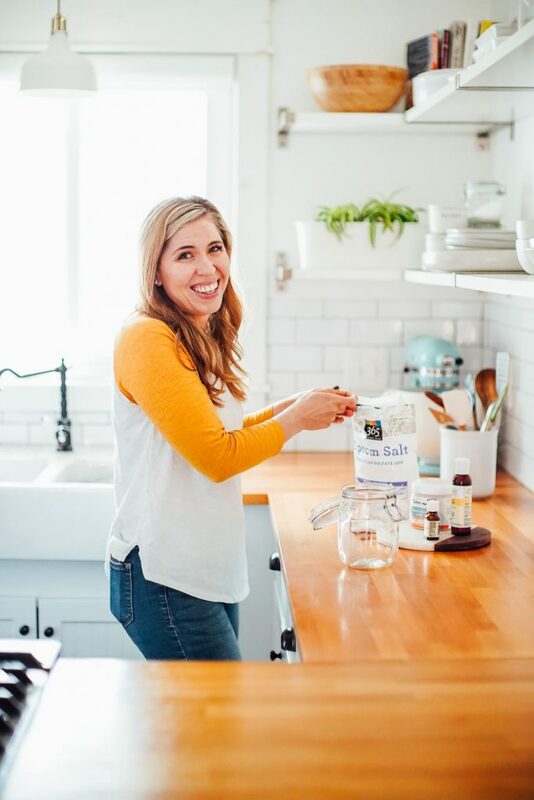 Last week, we talked about how to make homemade bath salts and use the bath salts to take a bath. Baths are touted as the ultimate form of self-care. My goal isn’t to promote this stereotypical form of self-care (which you can find all over Instagram). I believe self-care is about more than a bath experience. It’s a lifestyle choice. Self-care is about saying, “I’m going to intentionally take care of myself so I’m fueled up for this life I get to live.” When we do this, we’re better able to serve as a mom, wife, girlfriend, sister, teacher, boss…whatever you’ve been called to in this season of life. I’ve found that thinking about self-care in terms of 3 lifestyle categories, or lifestyle questions, is helpful. Doing this makes self-care more approachable for everyday life. Category 1 Simplify: How can I simplify my life to promote self-care? Category 2 Add: What can I add to my life to promote self-care? Category 3 Delete: What can I delete or delegate in my life to promote self-care? I shared all about this approach to self-care on the podcast. What I’ve added to my life has changed based on the seasons of my life. A couple of years ago, I added barre classes to my routine to get more exercise. Then, last year, our schedule as a family changed and I had to find a way to exercise closer to our home and the kids’ school. In the past, baths haven’t been something that I’ve considered as self-care, but over the last few months, they’ve become something that I’ve added to my life and look forward to on a weekly basis. I’m not here to tell you that you have to take baths. Or that baths are the ultimate form of self-care. What you add to your life, in the name of self-care, is entirely up to you. Do what makes you feel good, what recharges you, what fills up your tank. If a bath is something that appeals to you, something you would like to add to your life, today’s post is for you. 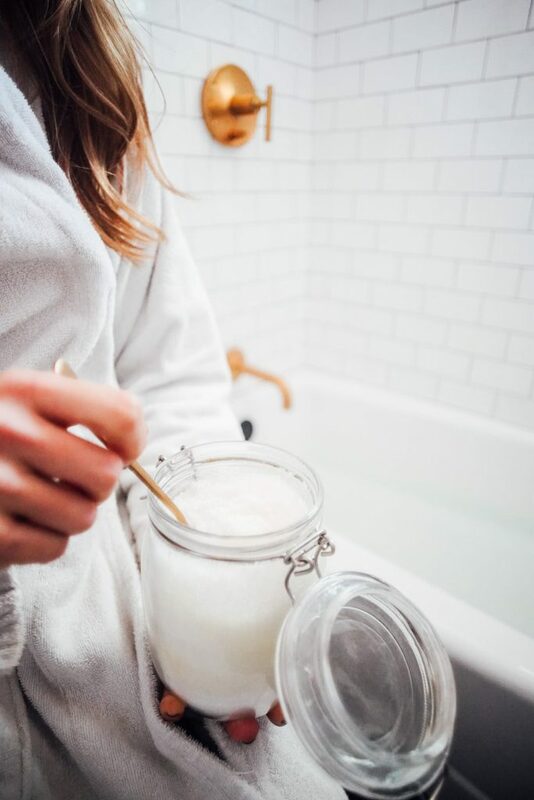 Let’s talk about my favorite bath ritual…a detox bath. A detox bath is a way of removing toxins from the body. Toxins don’t just show up in the chemical form (as many of us might think about), but also in the form of stress, tension, and constantly being attached to our phones (social media, email). This can take a toll on our body. Also, a side note, skin is our largest organ so soaking in a warm bath is a great way to sweat and pull toxins that have built up. In fact, I would say this is essential for our well-being. Is it essential to take a detox bath? No, absolutely not. But it is essential to take breaks, to turn off the ringer or email notifications, to unplug from constant stimulation. For me, that’s what a detox bath is all about. A detox bath starts with a bathtub and warm water. 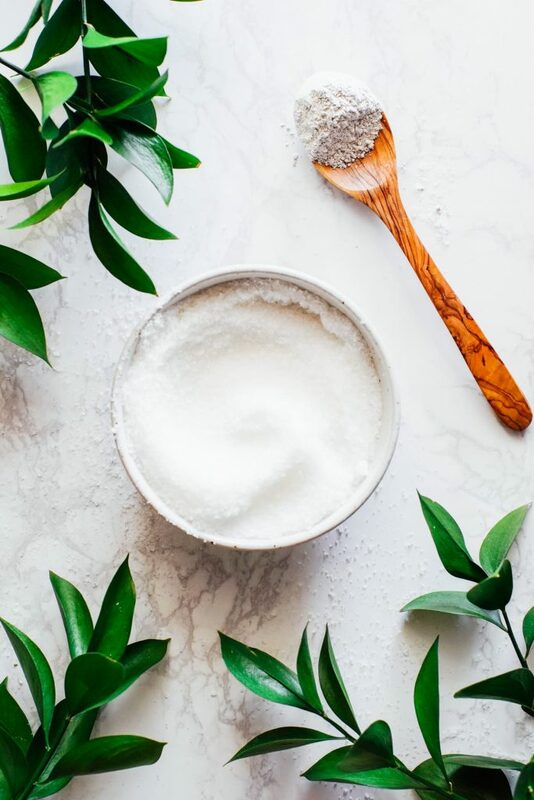 Bath salts, in the form of epsom salt or sea salt, are added to the water, along with clay and/or apple cider vinegar. Before you turn on the bath water, you’ll need to make bath salts. That’s why I shared a homemade bath salts recipe last week. 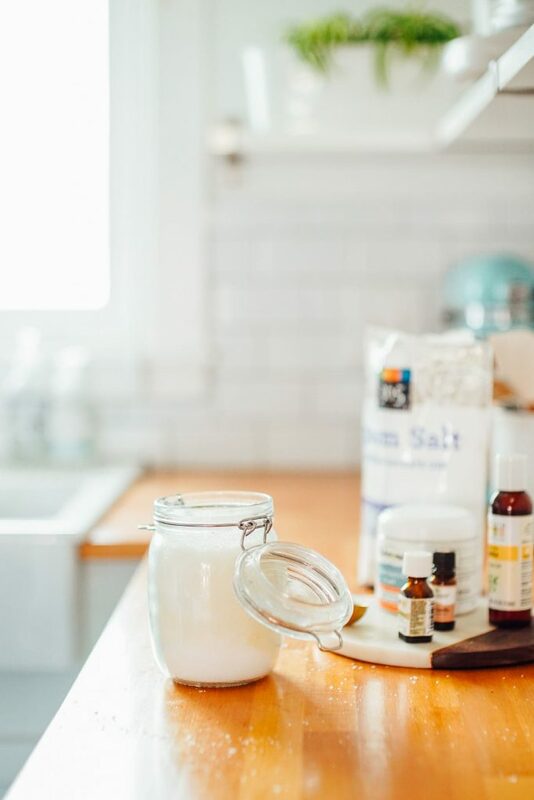 The bath salts are the foundation of your detox bath, followed by clay and/or apple cider vinegar. Below, I’ll share each of the ingredients used to make the bath salts. Clay, naturally found on the earth, is considered to be a detoxifying ingredient. This is a regular ingredient in facial masks that are designed to help de-congest the skin. Apple cider vinegar is another popular detox bath option. The water will smell like vinegar for the first few minutes, but then the smell disappears. Personally, I find the clay to be a lovely addition and my go-to option. Sure, it makes the water murky, but I don’t mind that aspect. I find the odorless clay mixes well with the hot water. I recommend using bentonite clay (I’ve linked my favorite brand in the recipe) or French green clay. Fill a bathtub with very warm water. Of course, use common sense when it comes to the temperature of the water. I love a very warm bath, but go with the temperature that feels most appropriate for you and your skin. Keep in mind, part of the goal of a detox bath is to sweat. So you want water that will be warm enough to aid in the sweating process. 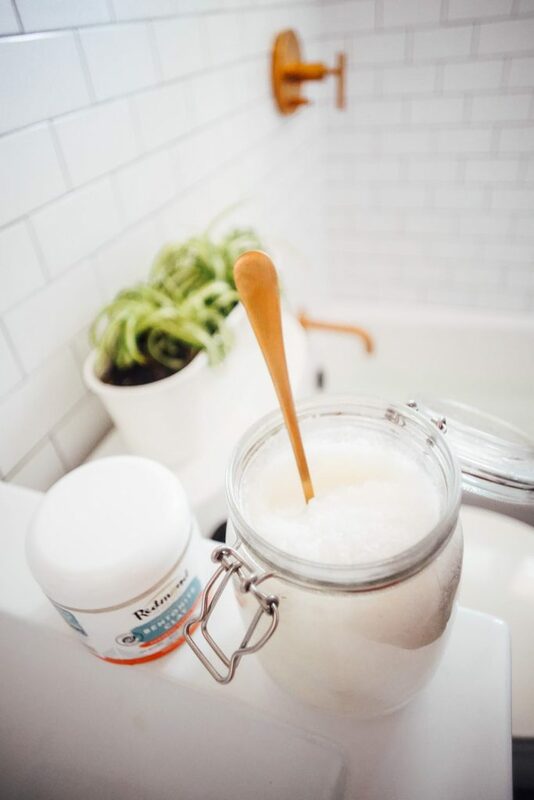 While the tub fills with water, add your bath salts. (The essential oils will begin to evaporate in the warm water when you do this, but I find they’re still worth adding to the bath salts.) While the bath is filling up, I grab some water which I’ll drink during the bath. Since I usually sweat during the bath, it’s important that I keep myself hydrated. It’s best if the water is room temperature versus cold. I also make sure to drink lots of water post-bath as well. Once the bath salts are added, add the clay or apple cider vinegar (or both). 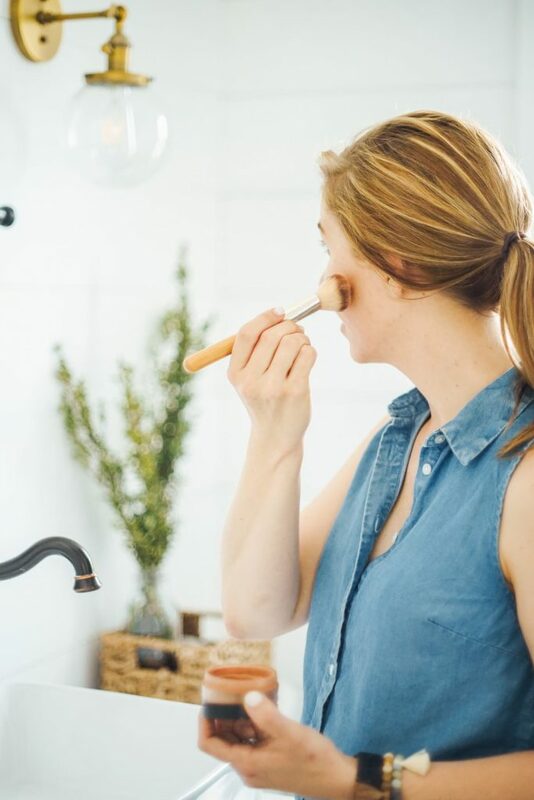 If you’re using bentonite clay, it’s important to avoid metal utensils. I usually add between 1/4-1/2 cup of clay per bath. At first, the clay may look chunky in the water, but it should distribute after a few minutes. The clay won’t ever fully dissolve, so the bath water will appear a bit muddy or dirty. This is normal. Once the bath is over and the water has drained from the tub, there will be clay (if using clay) remaining on the base of the tub. I usually turn the shower on for a minute to help the clay make its way to the drain, using my hand to aid in the process if needed. I can only speak from my experience. I personally feel super relaxed, chill, and ready to sleep. I’ve found that it’s best to take this kind of bath before bed, due to the tired feeling that can occur. I find this to be healthy–it’s like a natural melatonin for the body. It’s amazing how our body is able to naturally relax when we unplug and detox from all the things that keep us stimulated. Trust me, the work emails can wait until tomorrow. Before resting, I always make sure to drink plenty of water. I highly recommend you do the same after a detox bath. You don’t want to feel tired because you’re dehydrated. You want to feel ready for bed because you’re relaxed. 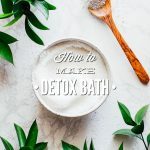 How Often Can I Take a Detox Bath? Go with what feels best. Personally, based on my experience, I recommend not taking more than one detox bath a week. If you find that you can handle more, try adding a second bath to your routine–if desired. Last week, I was battling a cold and sinus infection and took a detox bath, twice. I honestly think the detox baths helped me tremendously. I was able to relax and sleep better after the baths. That said, typically, I find one bath a week is the perfect ritual for me. Find a ritual, a rhythm and routine, that works for you. Or, just use a detox bath on occasion when you feel the need to relieve tension. I’m not a medical expert and I’m definitely not claiming that a detox bath is going to somehow solve all your woes. Actually, it probably won’t. This is simply a bath ritual that I’ve come to love and found to be incredibly therapeutic. Taking time to relax and recharge and detox is a good thing. It’s good for the body, mind, and soul. And it’s particularly important that we intentionally take the time to do this–whatever this may look like for you. Maybe this is a long walk after dinner or a weekly bath. That, my friend, is what taking care of yourself is all about. It’s about intentionally caring for ourselves, and this looks different for every single person. A detox bath is a way of removing toxins from the body. Toxins don't just show up in the chemical form (as many of us might think about), but also in the form of stress, tension, and constantly being attached to our phones (social media, email). This can take a toll on our body. 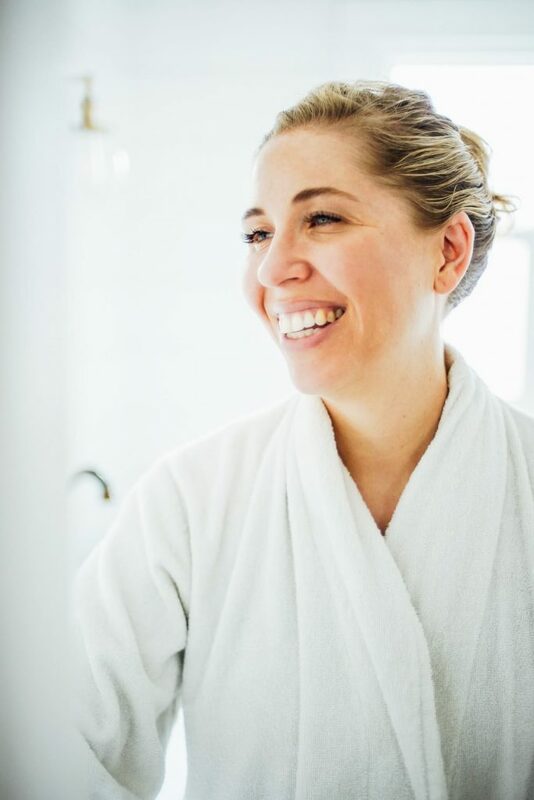 Also, a side note, our skin is our largest organ so soaking in a warm bath is a great way to sweat and pull toxins that have built up.A detox bath is a way to relax, recharge, and "detox" from all the things that may be pulling you in a million different directions. First, you'll need to make the bath salts. I shared an entire post about this, so I recommend reading this post first. 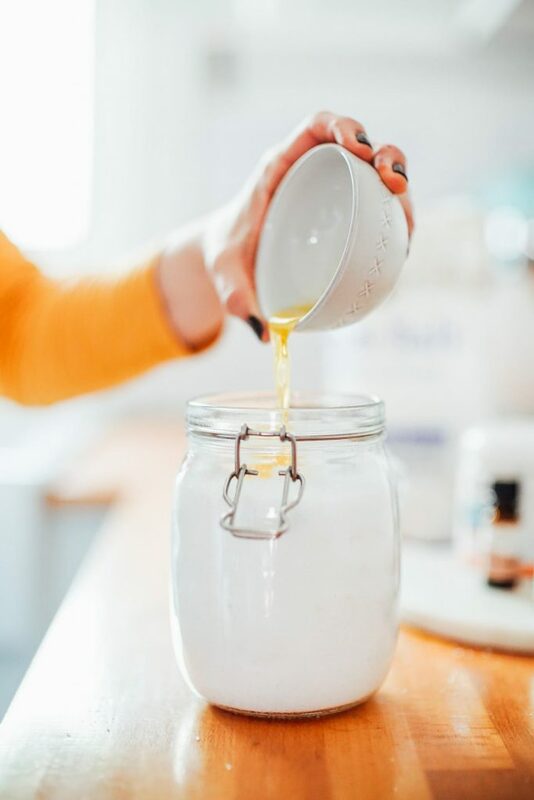 To do this, you'll need a jar and 4 cups of epsom salt or sea salt (or a combination of both epsom salt and sea salt to equal 4 total cups), 1 TB nourishing oil, and 5-20 drops essential oil of choice. Pour the salt of choice into the storage jar. In a small bowl, combine the nourishing oil of choice and essential oil of choice (between 5-20 drops, depending on aroma desired). 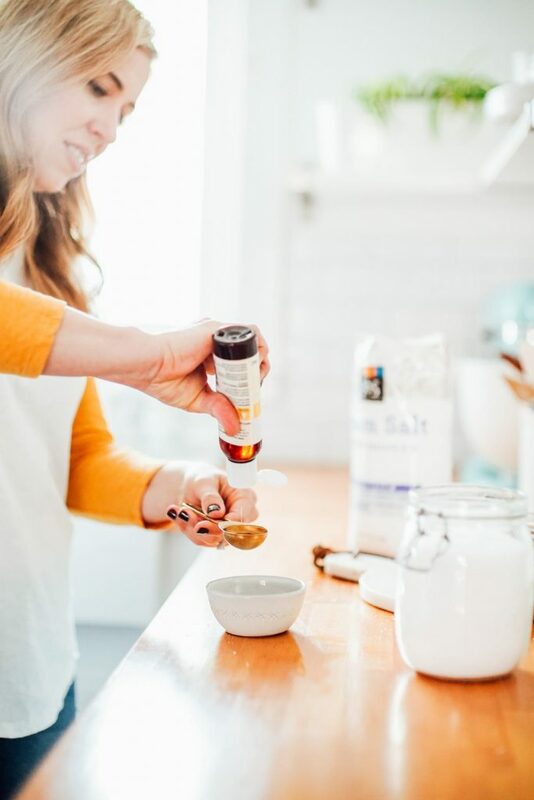 Pour the oil blend into the bath salts and carefully stir to blend everything together. Seal the jar and store away from direct sunlight. To take a detox bath, fill a bathtub with very warm water. Of course, use common sense when it comes to the temperature of the water. 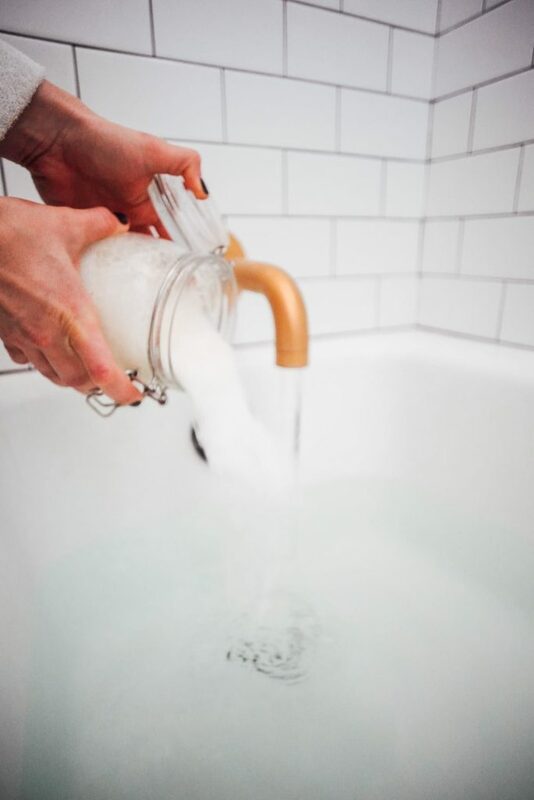 While the tub fills with water, add your bath salts. (The essential oils will begin to evaporate in the warm water when you do this, but I find they're still worth adding to the bath salts.) I like to add around 2 cups per bath, but you can go as low as 1 cup. The bath salts should fully dissolve in the bath. You might need to use your hands to swish the salts around until fully dissolved. Add the clay (and/or apple cider vinegar) to the bath water. I try to soak in the tub for about 20-30 minutes. That said, do what works for you. The goal is relaxation and stressing out about timing isn’t going to help you get in the zen zone. While soaking, be sure to drink plenty of water (preferably room temperature water since you're in a hot bath). You will sweat. This is normal. Of course, use common sense. This is how I take a detox bath. If you don't feel well, trust your instincts, use common sense, and get out of the bath.